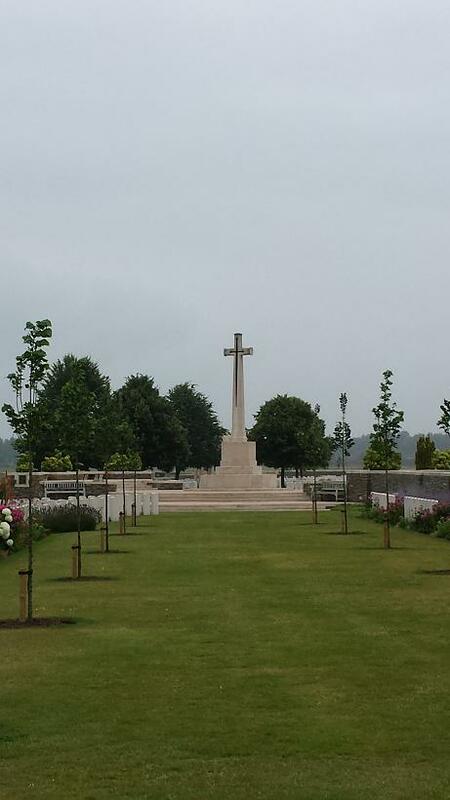 Zillebeke village and most of the commune were in the hands of Commonwealth forces for the greater part of the First World War, but the number of cemeteries in the neighbourhood bears witness to the fierce fighting in the vicinity from 1914 to 1918. Bedford House, sometimes known as Woodcote House, were the names given by the Army to the Chateau Rosendal, a country house in a small wooded park with moats. Although it never fell into German hands, the house and the trees were gradually destroyed by shell fire. It was used by field ambulances and as the headquarters of brigades and other fighting units, and charcoal pits were dug there from October 1917. In time, the property became largely covered by small cemeteries; five enclosures existed at the date of the Armistice, but the graves from No.1 were then removed to White House Cemetery, St. Jean, and those from No.5 to Aeroplane Cemetery, Ypres. ENCLOSURE No.2 was begun in December 1915, and used until October 1918. After the Armistice, 437 graves were added, all but four of which came from the Ecole de Bienfaisance and Asylum British Cemeteries, both at Ypres. ENCLOSURE No.3, the smallest, was used from February 1915 to December 1916; the burials made in August-October 1915 were largely carried out by the 17th Division. ENCLOSURE No.4, the largest, was used from June 1916 to February 1918, largely by the 47th (London) Division, and after the Armistice it was enlarged when 3,324 graves were brought in from other burial grounds and from the battlefields of the Ypres Salient. Almost two-thirds of the graves are unidentified. ENCLOSURE No.6 was made in the 1930s from the graves that were continuing to be found on the battlefield of the Ypres Salient. 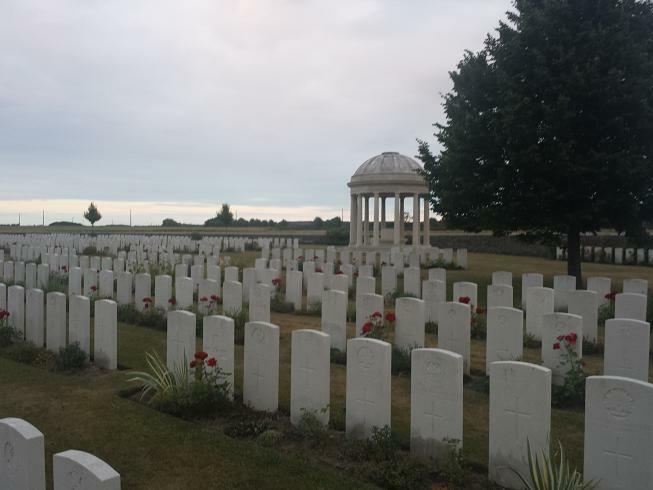 This enclosure also contains Second World War burials, all of them soldiers of the British Expeditionary Force, who died in the defence of the Ypres-Comines canal and railway at the end of May 1940. The canal lies on high ground on the west side of the cemetery. 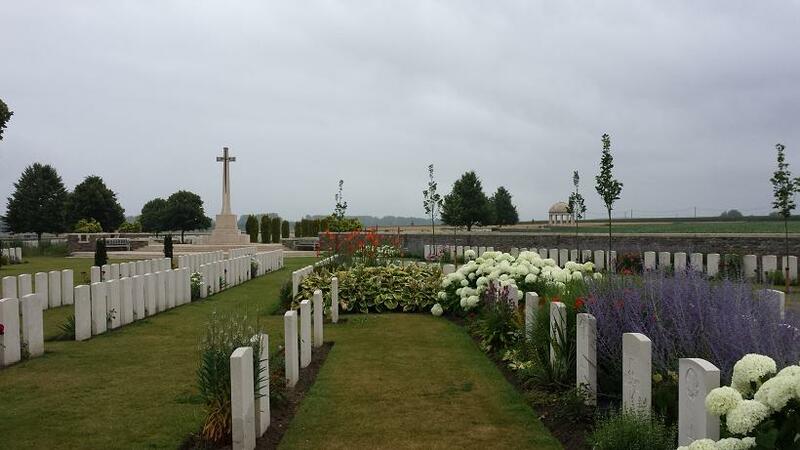 ASYLUM BRITISH CEMETERY, YPRES, was established in the grounds of a mental hospital (the Hospice du Sacre Coeur) a little West of the railway station, between the Poperinghe road and the railway. It was used by Field Ambulances and fighting units from February 1915, to November 1917, and it contained the graves of 265 soldiers from the United Kingdom, nine from Canada, seven from Australia and two of the British West Indies Regiment. BOESINGHE FRENCH CEMETERY No.2, a little South of Bard Cottage, contained the grave of one soldier from Canada. DROOGENBROODHOEK GERMAN CEMETERY, MOORSLEDE, contained the graves of two United Kingdom soldiers who fell in October 1914. ECOLE DE BIENFAISANCE CEMETERY, YPRES, was on the North side of the Poperinghe road, immediately West of the railway, in the grounds of a school (later rebuilt). It was used by Field Ambulances in 1915-1917, and it contained the graves of 133 soldiers from the United Kingdom, three from Canada, three from Australia and one of the British West Indies Regiment. KERKHOVE CHURCHYARD contained the graves of five United Kingdom soldiers, who fell in October and November 1918, and seven German. POELCAPELLE GERMAN CEMETERY No.4, between Langemarck and the Poelcapelle-St. Julien road, contained the graves of 52 soldiers from the United Kingdom who fell in 1914 and 1916. ZONNEBEKE BRITISH CEMETERIES No.1 and No.3 were on the South and North sides respectively of the Broodseinde-Zonnebeke road. Zonnebeke was occupied by the Germans on the 22 October 1914, retaken by the French on the following day, and evacuated at the beginning of May 1915; retaken by British troops on the 26 September 1917; evacuated again in April 1918; and retaken by Belgian troops on the 28th September, 1918. Four British Cemeteries were made by the Germans on the Broodseinde-Zonnebeke road; No.1 contained the graves of 31 United Kingdom soldiers (mainly 2nd East Surrey) who fell in April 1915, and No.3 those of 69 who fell in April, and May 1915. In all, 5,139 Commonwealth servicemen of the First World War are buried or commemorated in the enclosures of Bedford House Cemetery. 3,011 of the burials are unidentified but special memorials commemorate a number of casualties known or believed to be buried among them. Other special memorials name casualties buried in other cemeteries whose graves could not be found on concentration. Second World War burials number 69 (3 of which are unidentified). There are 2 Germans buried here. The cemetery was designed by W.C. Von Berg.